Thank you for your purchase of TAMRON TAP-in Console. When you download the file for installing the software, we ask that you carefully read and accept the user agreement. The installation begins when you execute the downloaded file. Please be aware that our company will not compensate the customer in the event that the download and installation of this software has some kind of impact on the customer's computer. Japanese, English, German, French, Spanish, Chinese (simplified) and Russian. Processing of personal information for users: Please see Privacy Notice. （１）	THIS SOFTWARE and related documents on prints or electronic including but not limited to User Manual ("DOCUMENTATION"), are owned by Tamron Co.,Ltd. ("TAMRON") and/or its licensors. The copyright and all the other rights to THIS SOFTWARE and DOCUMENTATION are reserved. THIS SOFTWARE and DOCUMENTATION are licensed, not sold or transferred, to you for use under terms of THIS AGREEMENT. （２）	THIS AGREEMENT allows you to install and use THIS SOFTWARE on your computer. TAMRON may acquire information needed for the identification of the computer in which THIS SOFTWARE is installed for being able to prevent unauthorized copying or the purpose of improvement of THIS SOFTWARE. （３）	Notwithstanding stated in section (2) of Article 2, you may make one copy of THIS SOFTWARE and DOCUMENTATION for backup purposes only. （１）	You shall not sublicense, transfer, sell, distribute, rent, lease or lend THIS SOFTWARE and DOCUMENTATION or any part of thereof. （２）	You shall not copy, decompile, reverse engineer, disassemble, modify, or create derivative works of THIS SOFTWARE or any part thereof. （３）	Copyright notices, trademarks and the other intellectual property notices contained in THIS SOFTWARE and DOCUMENTATION shall not be modified, removed or deleted. THIS SOFTWARE is provided “as is” and TAMRON hereby disclaim all warranties and conditions with respect to THIS SOFTWARE, either express, implied or statutory, including, but not limited to, the implied warranties and/or conditions of merchantability of fitness for a particular purpose and non-infringement of third party rights. TAMRON and its subsidiaries, and those distributors shall not, directly or indirectly, be liable, in any way, to you or any other person for the content you receive using or non-using THIS SOFTWARE and DOCUMENTATION or for any inaccuracies, errors in or omissions from the content. 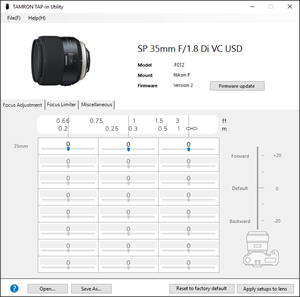 TAMRON will support at its sole discretion in case that you cannot use THIS SOFTWARE due to a failure of THIS SOFTWARE or DOCUMENTATION: provided, however, this support does not guarantee or warrant that any or all malfunction of THIS SOFTWARE or DOCUMENTATION can be successfully fixed. TAMRON may terminate this support at any time. TAMRON may, at its sole discretion without notice, modify, amend or update THIS SOFTWARE and DOCUMENTATION at any time, and such are subject to the terms of THIS AGREEMENT. （１）THIS AGREEMENT is effective until terminated. Your rights under THIS AGREEMENT will terminate automatically without notice from TAMRON if you fail to comply with any term(s) of THIS AGREEMENT. Upon the termination of THIS AGREEMENT, you shall cease all use of THIS SOFTWARE and DOCUMENTATION, destroy all copies and delete electronic data from your computer full or partial, of THIS SOFTWARE and DOCUMENTATION. （2）The provisions of Article 2, Article 3, this Article, Article 7, Article 9, Article 10 and Article 13, shall survive the termination or expiration of THIS AGREEMENT. You agree to comply with applicable export control laws, regulations, or orders, and not to export or re-export THIS SOFTWARE directly or indirectly, in contravention of such laws, regulations or orders. THIS AGREEMENT shall be governed by and construed in accordance with the laws of Japan. THIS AGREEMENT shall not be governed by United Nations Convention on Contract for the International Sales of Goods. Any dispute arising from or in connection with THIS AGREEMENT shall be subject to the exclusive jurisdiction of the Tokyo District Court. If for any reason a court of competent jurisdiction finds any provision, or portion thereof, to be unenforceable, the remainder of THIS AGREEMENT shall continue in full force and effect. THIS AGREEMENT constitutes the entire agreement between the parties with respect to the use of THIS SOFTWARE and DOCUMENTATION and supersedes all prior or contemporaneous understandings regarding such subject matter. No amendment to or modification of THIS AGREEMENT shall be binding unless in writing and signed by TAMRON. Any translation of THIS AGREEMENT is made for local requirements and in the event of a dispute between the Japanese and any non-Japanese versions, the Japanese version of THIS AGREEMENT shall govern. This software program operates on a computer satisfying the following conditions. * Functionality of this software program is not guaranteed on all Windows computers * Functionality of this software program is not guaranteed on all Mac computers. After accepting the user agreement, please download the installation file. * 2018/04/16 Tap-in Utility has been updated to "Ver.1.4.0.". Please update the software. By first updating firmware to the most up-to-date version with use of TAP-in Console, it becomes possible to use all the functions of TAP-in Console compatible with this lens. For details please visit here. Initial firmware update by Tamron service facility is required to enable compatibility with the TAP-in Console. For details please visit here. For Online Help please visit here.